Thomas Baillie has urged his Kettering Town players to take out their frustration on Beaconsfield SYCOB at Latimer Park tonight (Tuesday). 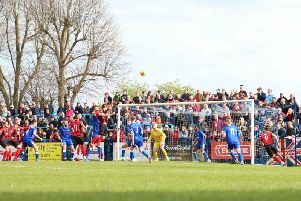 The Poppies look set to finally get back into action following a series of postponements, which have left them without a game for over three weeks. The latest match to fall foul of the weather was Saturday’s home clash with Leighton Town. However, Kettering now seem ready to renew their bid for the Evo-Stik Southern League Division One Central title. The Poppies currently sit three points behind new leaders Bedworth United, who are also in action at Bedford Town tonight, but have three games in hand. But joint-boss Baillie’s main concern for the time being is to just ensure his team get playing again. “We played seven games in November and we have only played six since then so it has been frustrating,” he said. “And when I start looking at statistics like that, you know I am bored! “Hopefully we will get to play and everyone is desperate for us to get back in action. “It will be a chance for the players to take out their frustration and try to pick up a good result. “There is the old argument of whether it is better to have games in hand or points on the board. “We haven’t played for over three weeks but no-one has really pulled away in that period. It’s been a season of struggle for Beaconsfield so far. But Baillie isn’t fooled by their lowly league position after they recorded an impressive 1-0 home win over high-flying Hanwell Town at the weekend. “If we have learned anything from this season, it’s that league positions count for little on the day. Tommy Hull will finally begin a two-match ban this evening but the Poppies are otherwise at full-strength for the game. But Baillie hasn’t ruled out the possibility of adding a new signing or two to the squad in the near future. “We are always looking to freshen things up and strengthen the squad if we can and I wouldn’t rule anything out,” he said.